✔ MATERIAL - 100% premium quality cotton. Soft, breathable and comfortable for a growing child\'s sensitive skin and give them natural healthy care. ✔ FEATURES - Toddler/little boys short sleeve, crew neck t shirt and matching shorts, easy pull on and off. Cute cartoon dinosaur and polka dot print. 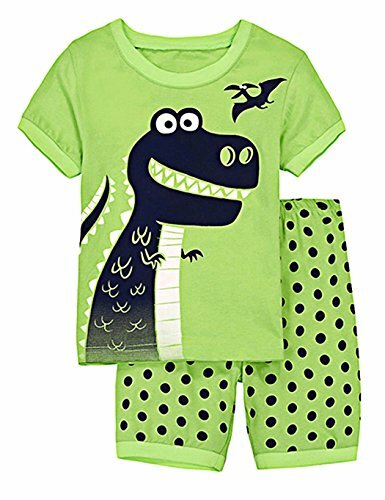 ✔ BOY\'S FAVORITE - Kid suit fashionable and stylish, cartoon dinosaur on the front, kids favorite. Your boy would love this great looking. ✔ OCCASION - Boy daily casual wear out, the short sets also suitable for daily pajamas sets and sleepwear. ✔ SIZE GUIDELINE - Fit for 2-8 years little boy. Our size is Asian Size, it will be smaller than the US Size. Please order one size up if necessary. Please refer to the size chart on the photo list carefully before placing order.